Take in the Game or watch the Commercials! What to Bring: yourself, a friend, your favorite Super Bowl snack to share. 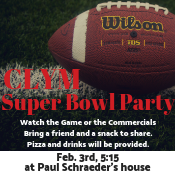 Pizza and drinks will be provided.